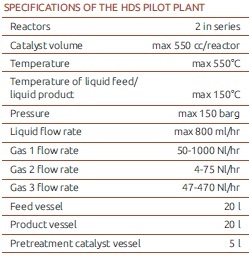 HDS is a large pilot-scale, fully automated hydroprocessing unit with a maximum capacity of ~14 lit/ day processing feedstock. Determination of optimum operating conditions for hydrotreating processes. 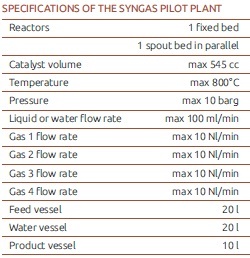 The synthesis gas production unit was designed and manufactured in CPERI, aiming to convert natural gas, hydrocarbon gases and oxygenated liquids to synthesis gas. PSDI offers a range of testing facilities for various fuel cell applications both for low (polymer exchange membrane fuel cells, PEM-FCs) and high (solid oxide fuel cells, SOFCs) temperatures. Testing includes complete performance evaluation of fuel cells, single cells or stacks, under customer’s set conditions as well as stability assessment following standard accelerated stress test protocols. The test benches can handle single cells or stacks in a power range between few W and approximately 3 kW. All test benches integrate comprehensive solutions for reliable and precise temperature, humidity and flow rate control. They incorporate fully programmed electronic loads in order to simulate a wide range of potential fuel cell applications. All critical test inputs and outputs are automatically monitored and recorded through a PIMS data collection system. Beyond the on-line and continuous data recording, remote live view and control of the test benches operation is available through web log-in in the PIMS data collection system. In addition to the standard systems for PEM-FCs and SOFCs, the test benches can accommodate electrolyser single cells or stacks. The regenerative PEM fuel cell/electrolyser test bench comprises all necessary instrumentation for efficient control, continuous operation and collection of data for a period of months of conventional and/or regenerative fuel cell systems. It can operate under high pressure, closed-loop system configuration with remote monitoring and surveillance. Temperatures up to 1100 °C, complete electrochemical characterization, conductivity measurements, on-line gas analysis, multi fuels and gases H2, HC, CO, CO2, H2O, etc. Power up to 3kW, closed-loop, pressurized operation, H2- O2 gas storage, automatic unattended operation, PIMS server-operating control and data acquisition system, remote live view.